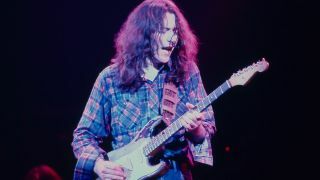 A collection of 21 of Rory Gallagher’s guitars will be on display at this year’s UK Guitar Show as part of the event’s Vintage Zone. The show will take place at London’s Olympia on September 29 & 30 and is brought to you by the organisers of the London Drum Show and the London Bass Guitar Show and is run in association with MusicRadar, Guitarist, Total Guitar, Guitar Techniques and Louder. Among the collection, which has been picked by Gallagher’s family, will be his very first flat top acoustic, his iconic 1961 Fender Stratocaster, his 1959 Fender Esquire and a 1933 National Triolian Resonator. In addition, we can also reveal that Seven Decades will be in attendance, bringing their collection of vintage guitars to the show. Alongside an exhibition of their guitars and guitar memorabilia, Seven Decades will be perform Telecaster, Les Paul and Stratocaster sessions. On the evening of both days, they’ll bring the curtain down in the Vintage Zone with music from their hit show and celebrate iconic musicians including Sister Rosetta Tharpe, Albert Collins, Jimi Hendrix and Eric Clapton. Orange, Marshall and Vox will also show off a collection of amps at the 60 Years Of British Tone exhibition and will document the story of the three iconic brands and their place in the UK’s rich rock tone heritage. Periphery’s Misha Mansoor and YouTube sensation Justin Sandercoe will give free lessons at the UK Guitar Show, while Alice Cooper guitarist Nita Strauss will play on the Main Stage at 3pm on the Sunday.